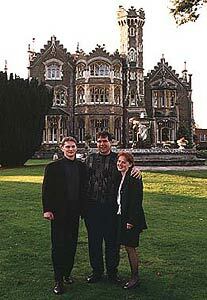 As we had done in 1992 we once again drew at random the name of one attendee from all those that had registered before the day itself and gave them the chance to bring a friend to a meal at Oakley Court Hotel, the location used for the filming of The Rocky Horror Picture Show. Our lucky winner for 1994 was Gary Stevenson, who brought a friend along to the meal. Sal Piro joined us for the meal and we spent several hours showing the winners around the hotel, pointing out the original locations used for Frank 'N' Furter's Castle, we also took a wander around the grounds to show them the locations used for the exterior shots. The Griffin returned as our prize again in 1994, this time we commissioned an engraved glass as the winners prize. These were made as an exclusive Transylvania 1994, the only way to get one was to be a winner of the costume competition. The Costume Contests again ran throughout the day and we had even more entries than the 1992 Convention. 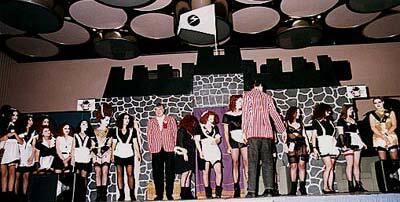 Dave and Steven try to keep control of a multitude of Magenta's in one of the costume competitions in this image (above). 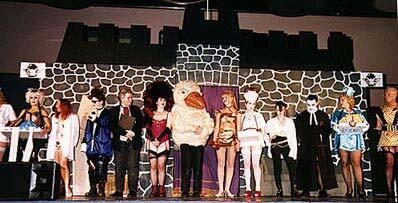 In the 'Other' category we had 'Crims', 'Phantoms', 'Usherettes', 'Space Riffs and Magentas' and even a large duck. The duck was actually me, I admit it now. I did however neglect to mention that I would be wearing it to Steven causing some confusion to my co-host! A big thank you to Jan for the loan of the costume, however I would like to know why she owned a duck costume to start with. The prizes were presented at the end of the day section of the Convention by the one and only Richard O'Brien.